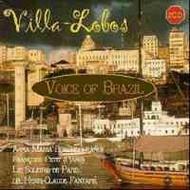 Heitor Villa-Lobos was born in Rio de Janeiro , 5 March 1887 and died there on 17 Nov 1959. He stands out as the single most significant creative figure in 20th-century Brazilian art music. This significance stems not only from his international recognition, but from his achievement in creating unique compositional styles in which contemporary European techniques and reinterpreted elements of national music are combined. His highly successful career stood as a model for subsequent generations of Brazilian composers. The output of Villa-Lobos is prodigious and varied. His style encompasses Brazilian folksong and traditional rhythms as well as a number of European art-music influences, which he merged in more than one way to produce music which from the start was wholly original. Eschewing traditional formal structures, his music can seem, from a purist angle, sometimes disorganised, but in its freedom of flow and expression lies the distinctiveness of his compositions which are never less than fresh and invigorating to hear. These recordings were originally issued in France on 3 LPs in 1972, one of which won the Grand Prix du Disque for that year. It was also highly successful in Brazil. Les Solistes de Paris were formed in the 1960’s by Henri-Claude Fantapié, and over the years, proved to be a valuable starting point for many musicians who went on to greater fame – such as Guy Touvron and Bernard Soustrot. The ensemble disbanded in the early 1980’s. Anna Maria Bondi was born in Rome. Her operatic and concert career has taken her all over Europe and the USA. She has taught at the School of Operatic Lyric Art in Paris. Her other recordings include religious vocal music of Couperin, songs and cantatas by Scarlatti, solo motets by Vivaldi, operatic arias by Haydn and the music of Pergolesi. Harpsichordist and pianist Françoise Petit has had a busy career both recording and concertising. On piano she has re-introduced a great deal of 19th century music to French audiences. She is an inspired interpreter of the works of 20th century composers, and is also a fine accompanist.